The iDEN CellReader is the ideal wireless communication solution for commercial and industrial solid state electric meters. 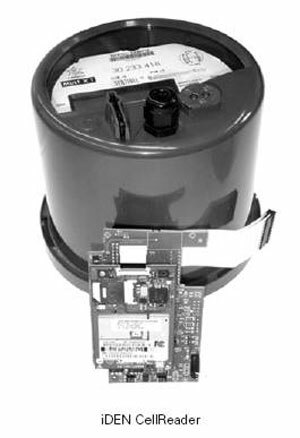 It provides these meters with RF communications capabilities and complements the effectiveness of meter data collection and monitoring of electrical commercial and industrial customers. The iDEN CellReader is the ideal wireless communication solution for commercial and industrial solid state electric meters. It provides these meters with RF communications capabilities and complements the effectiveness of meter data collection and monitoring of electrical commercial and industrial customers. The iDEN CellReader is a single-board device that fits easily under the glass of the meter and does not require the purchase of another modem or communications board. It operates on any iDEN wireless network in North America enabling data communications at practically zero-variable cost.